Silver/grey hair seems to be a trend that's quite "in" at the moment, a trend which I happened to join in on. People immediately jump to the conclusion that bleach will instantly kill your hair, which I suppose yes it will if you don't look after it. Considering I have been having my hair bleached since I was 16/17, I would say I have the "how to" down to a T, so here I am to share with you how to get the silver hair look the easy, cheap but safe way. 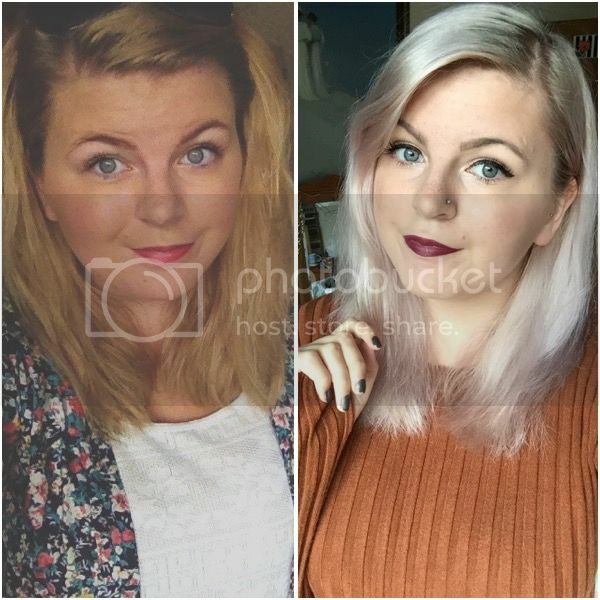 I first started dying my hair the silver/lilac it is now about a year ago in the hope of maintaining a lilac colour. Safe to say I soon got fed up of the whole lilac concept and decided that silver was the colour I wanted to stay! Step 1: The dye Naturally, I have quite dark blonde hair which was already dyed a golden blonde colour so it wasn't necessary for me to bleach my hair more than once, luckily. I use the Schwarzkopf Live Colour XXL dye in shade 00A, the lightest one. This dye is bound to turn your hair a warmer toned blonde as opposed to a white, platinum colour unless you already had super light hair. I tend to leave the dye on for around 20 minutes, but it just depends how quickly my hair takes to it. 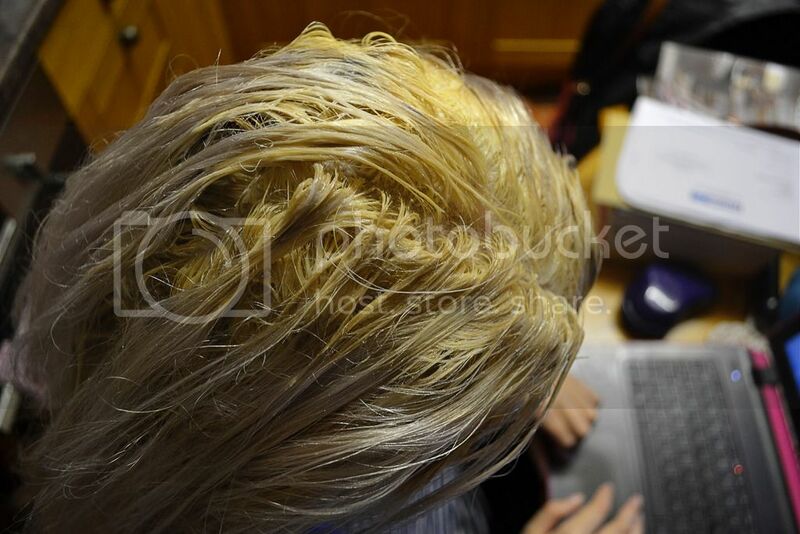 Step 2: Toner If your hair does turn a really brassy and let's face it, an awful colour, DON'T PANIC. That's what toner is for, a wonderful creation which has saved me from the most dreadful home dye jobs. Since I stopped using a lilac dye once I had toned, I have found I'm better off using two toners to achieve the silver tone I like. Once the bleach is all washed off, I towel dry my hair and use the Schwarzkopf Live Colour XXL Toner Mousse which reduces the brassy tones instantly, it's honestly a miracle worker and is able to be washed off after 5 minutes! (I forgot to picture it though, doh!) Now, onto the best product I have ever used on my hair... Directions Silver Toner. 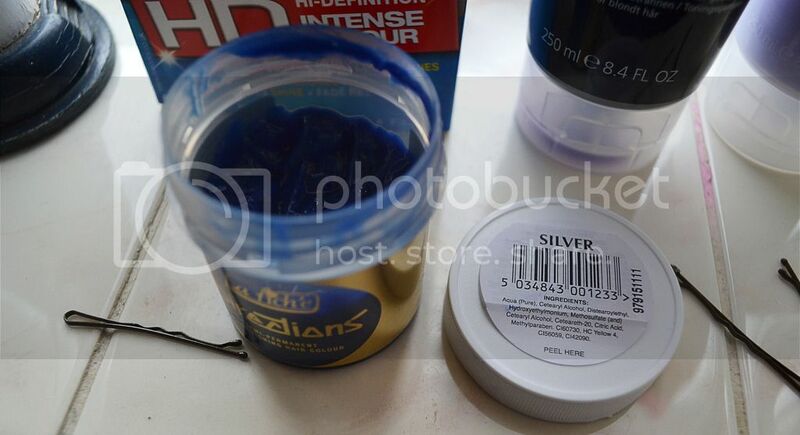 Oh my god, if you're a fellow blonde and want to achieve an ashy/silver colour, use this - it saves so much time and hassle! The colour is absolutely terrifying, I know, but it's a bloody good product! The intense blue colour of this toner counteracts with the yellow tones that you most likely have from the dye. Once I've dried my hair after using the Schwarzkopf toner, I apply this and leave it on for 2-4 hours as I like the tint it leaves on my hair too, but I'm sure leaving it on for a less amount of time won't do it any harm. However long you leave it on for, it will not damage your hair as it works as a sort of hair treatment/conditioner too... My hair feels incredibly silky and soft once it's washed off. Step 3: Maintain If you want to be part of the silver haired squad, you gotta get yourself some purple shampoo and conditioner. 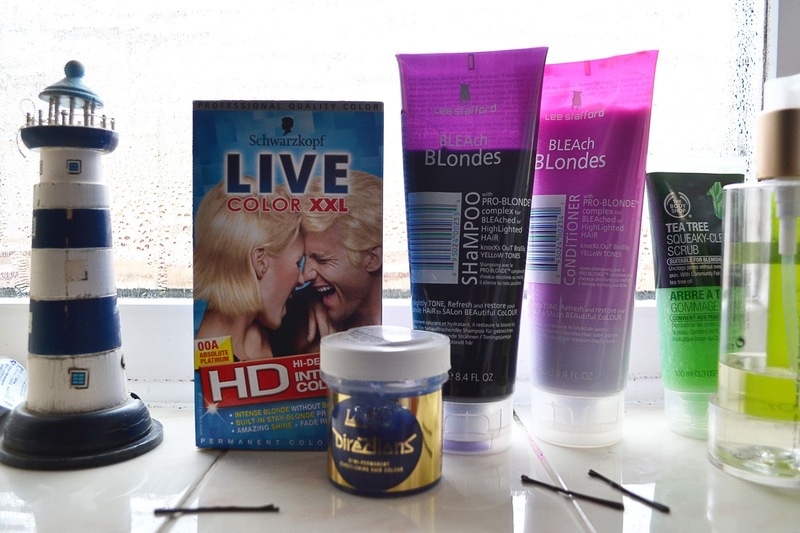 Over the years I've tried many but hands down the best ones for me are from the Lee Stafford Bleach Blondes range. They're a little more expensive than your average shampoo, but take advantage of the Boots special offers and stock up, you're going to need lots! I use the purple shampoo everytime I wash my hair, which tends to be twice a week just because I find if I wash it every other day, my hair becomes extremely dry, not a fun time when you have a big thick mane of hair. These products leave my hair with a lovely lilac/pink tint which I have become quite attached too, I feel like I'm betraying them if I use a shampoo which doesn't give me the same tint. Is that weird? Probably. But, that's all I do! Simple right? My hair is still in a healthy and amazing condition which trust me, I'm shocked about too. When my roots need doing I just repeat the steps but obviously, only on my roots. If you have any other questions then feel free to leave a comment or tweet me and I'll be happy to give you any help or advice you may need (but I will warn you I have no hairdressing experience). What are your thoughts on the silver hair trend? Have you ever dyed your hair? It looks so pretty, I wish I wasn't allergic so that bleach wasn't safe for me to use! You hair is sooooo gorgeous!! Your hair looks awesome, I love it! I remember when I had white blonde hair (looked horrendous on me as I'm so pale!) I tried to tone it to go whiter and left the violet toner on so long it went purple haha. This looks so great on you! It definitely seems like a lot of work though. Great post! Not sure if we are connected on a certain level on distance girlie but thank you for this post, honey :) I have been having the EXACT SAME issues with my skin lately - so strange it broke out kinda out of nowhere awww. Thanks for recommending these products honey, I will defo be checking them out. You are so so so beautiful and the kindest person ever. Love ya! Silver hair is perfect for you, Kat! Any tips on dying your hair purple? You look super sophisticated with silver hair! I love this. I've seen so many gorgeous people with the silver/gray hair trend but I don't think it would look good on me! I'm more for the darker hair. I used to be a major lover of dark hair, with naturally mouses brown/aurburn-y hair I've dyed it dark brown since I was about 14.. with changes in between but last year I decided to go lighter and now I'm at the silver stage which I absolutely love! it took a lot of doing and I don't think I'll be going dark again for a while. I just have very light blonde hair rather than silver, but toning it is something I always have to keep on top of. I've never used the Directions toner before; I usually completely swear by the Bleach London silver shampoo, but I'll have to give this a try - awesome post!